Long ago, when you and your partner left your home to get married it was considered eloping—an act typically brought about by a lack of family approval. Nowadays, however, we call this a destination wedding. Though some destination weddings do just involve the couple, most couples bring along their closest friends and family for a week-long vacation celebration. At Dreamers Travel, destination weddings are our specialty. We understand that couples want to maximize the celebration of their big day, and we use this understanding—along with our travel experience and expertise—to help tailor your dream wedding. Whether you want to marry ontop a snowy mountain peak or an exotic tropical paradise, we can help. Contact our expert travel agents today! Not sure if a destination wedding is right for you? 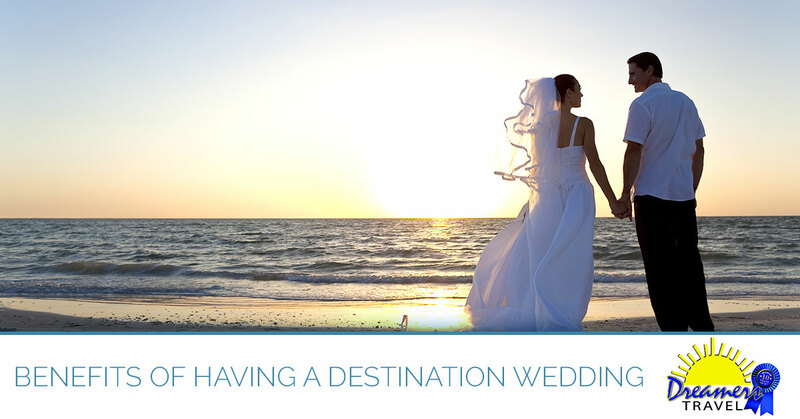 Read on to learn about some of the benefits of having a destination wedding. Almost all weddings are memorable. However, when you get on a plane and go to an exotic location—like a Caribbean island—you ensure that your big day is especially memorable. And after all, doesn’t a moment so significant as a wedding deserve a once-in-a-lifetime? And as an added bonus, in 10 or 20 years when it comes time to celebrate your anniversary, you have a reason to take a tropical vacation. The affordability of destination weddings has played a big part in their popularity. Because most destination weddings take place at all-inclusive resorts with only the couple’s closest family and friends in attendance, the cost is significantly reduced. A traditional wedding, for example, with a 150-person guest list and a week-long honeymoon can easily run you $20,000+. A wedding held at an all-inclusive resort costs a fraction of this, and there is no additional cost for a honeymoon—you are already in a perfect honeymoon destination. Wedding planning is stressful. When you make an all-inclusive vacation package a key part of your wedding and honeymoon, you eliminate a great deal of stress. Not only are there fewer people to plan for, but many all-inclusive resorts that cater to destination weddings have perfected their services and will do all the heavy lifting, allowing you to relax and truly celebrate your special day. Unlike a traditional wedding held in your hometown, the moment you say “I do!” at a destination wedding your honeymoon begins. Not only does this eliminate the hassle of waking up early to catch your flight to your honeymoon location, but it also provides a special opportunity to celebrate and spend some quality time with your closest family and friends. Destination weddings are often seen as a hip alternative to a traditional wedding—and the option that doesn’t require you to choose between your or your partner’s hometown. If you are ready to start planning yours, contact Maryland’s premier travel agency. We can help you plan the perfect beach wedding and set you up with some all inclusive vacation packages. Learn more about our destination wedding packages here. Contact us today!